Cleaning soot off fireplace walls is something many homeowners will have to contend with. The biggest cause of soot stains, which are created by carbon that is present in the fire's smoke, is when homeowners do not vent the fireplace properly before starting a fire. However, soot can build up over time as well just from normal daily use. 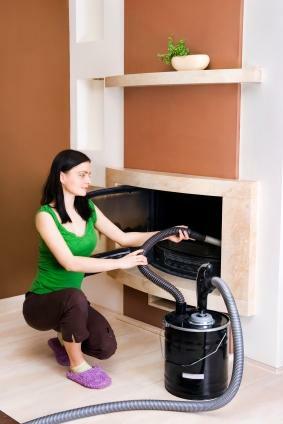 When cleaning soot off fireplace walls, it's best to do so as soon as you realize the fireplace is dirty. The longer the soot is left to set, the harder it will be to scrub off. There is one caveat to this direction though. You should never try to wash the fireplace while it is still hot. You should put down a dropcloth if the room where the fireplace is located is carpeted. Pull the andirons and the grate out of the fireplace and put them outside or on a plastic tarp. Remove any pieces of wood or coal, placing them in a bucket. Use the fireplace shovel to scoop out all of the ashes in the bottom of the fireplace, putting them in the trash. Pick up any remaining dust with a hand vacuum cleaner or a hand broom and dustpan. 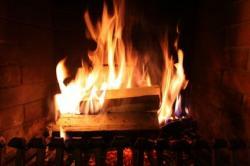 Cover the floor of the fireplace with at least three layers of newspaper so you won't have to clean it a second time. Starting as high up as is visible, scrub the fireplace walls from left to right with a wire brush. Let the soot fall onto the newspaper. Throw away the top layer of newspaper and replace it each time it gets too full. Continue until you have scrubbed the entire interior of the fireplace. Put down a new layer of newspaper. Fill a bucket with a gallon of hot water, six tablespoons of trisodium phosphate and a cup of bleach. Stir the mixture with a spoon. Place the bucket inside the fireplace and dip the wire brush inside. Scrub the walls again, as before. Remove the newspaper and scrub the floor. Wipe the fireplace with damp cotton rags to remove the cleaning solution. Since the trisodium phosphate solution can cause an allergic reaction, you should wear rubber gloves, long pants and long sleeves when cleaning the fireplace with it. You should also wear goggles, which can be found at the hardware store. It's best to open the windows in the room where the fireplace resides to ensure there is enough ventilation to prevent the bleach from harming the your lungs. If there is only a little bit of soot on the walls of the fireplace, you may not have to go through the entire cleaning process. Instead, try using a Soot Eraser, which is a sponge-like cleaning apparatus made from vulcanized rubber. All you has to do is rub the eraser on the offending spot. There is no water needed. If you cannot find a soot eraser, try to achieve the same result by using a ball of modeling clay. This is also a good way to remove soot spots from the mantel. The most important thing to do to prevent future soot stains is to adjust the flue before starting a fire. This will ensure that the smoke exits through the chimney instead of building up in the fireplace itself. You should also make sure that their fuel is dry before they put it in the fireplace. Wet fuel tends to generate a lot more smoke.